Las Vegas telecommunications company to bring you the latest and greatest in VoIP services! No matter what kind of business you’re in, whether you’re a remote worker or a large call center that specializes in inbound and outbound calls, the EQ-F3P is your perfect sales and communications solution. EquiiText specializes in using our patented artificial intelligence system to make SMS marketing simpler and more functional than ever before. 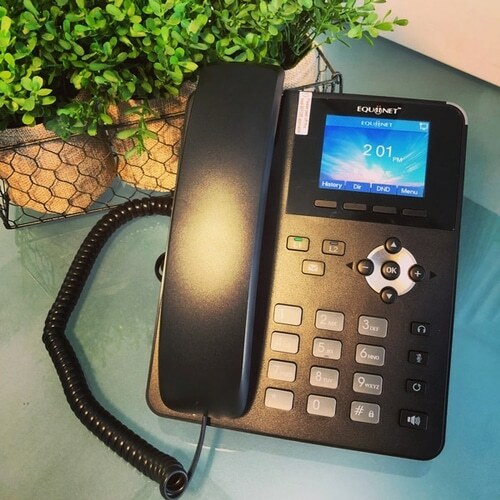 Recognizing this advantage, we have combined our ALINA (Artificial Language Intelligence Application) with Equiinet’s robust VoIP business phone. If you miss a call, the ALINA system will send you an SMS alert regarding the call,and it will also send a customized text to the caller, letting him or her that you will call them back! Not only is it SMS enabled, it also comes equipped with a feature known as Voicemail Auto-Drop: now you have the ability to leave pre-recorded voicemails quickly and efficiently, allowing you to call more leads per day than ever before! Gone are the days of waiting for the customer’s voicemail to play through before you must “leave a message after the tone.” Thanks to the smart EQ-F3P, you can “drop” your voicemail the second the phone stops ringing and move on to your next call! The built-in ALINA system is designed to begin the message only after the tone is heard, ensuring your voicemails will never be cut off due to the customer’s voice recording. The average length of time it takes to ring through to a customer’s voicemail box is twenty seconds, or four rings. A voicemail recording can last for up to three minutes, which potentially means a single phone call can take nearly seven minutes. With the EQ-F3P Voicemail Auto-Drop,you can call twenty-one people in that same length of time. In a six-hour day, that equates to an additional one thousand calls! If you’re still reading instead of calling us for your EquiiText phone right now, let me also add that the EQ-F3P also allows you to record your own IVR so inbound callers are greeted by your voice and directed to the appropriate extension. It is even designed for simultaneous ring capabilities,ensuring that calls will rarely be missed as they will also be delivered to your cell phone. These are only a few of the incredible features offered on the EQ-F3P, so give us an email, call or text today to find out how this AI Super Phone can be yours! This offer is only available for a limited time, so don’t wait – contact us now!